ONE OF Galway’s most venerable arts groups is celebrated in Kenny’s Gallery from next week, when the venue hosts a large scale exhibition saluting 80 years of Galway Art Club. The exhibition opens on Friday January 26, and the evening will also see the launch of Alison Titley’s The Early Years of Galway Art Club, a fascinating and copiously illustrated history of the collective’s initial decades. 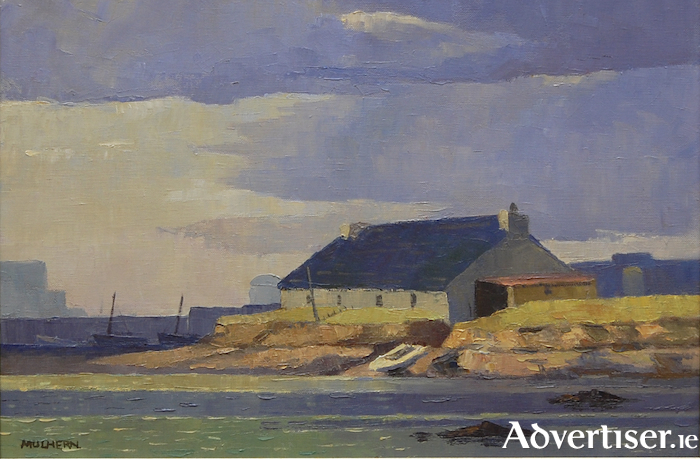 Galway Art Club was founded in October, 1937, its founders including Geraldine Dillon, Hubert Broderick, Francis Corbett, and Donagh McDonagh, the well known poet and writer. In the 1940s the group began to exhibit its members' works and among the famous artists associated with the club are Charles Lamb, Aileen Law, and Clare Sheridan. “It’s going to be a very good exhibition,” Tom Kenny [photogarphed below] tells me as he looks forward to next week’s opening. “Up until the foundation of the Galway Art Club there was no visual art movement of any type in Galway or the west. There were occasional visitors like Paul Henry or Jack Yeats or Sean Keating but there was nobody coming up from the west itself, so when these people started initially it was a brave move because there was no art-loving public there at the time. "People would have viewed them as being local and amateur and had the attitude that ‘They’re OK, they’re not bad’, but actually a lot of them were really fine artists in their own right and this exhibition will show that. Their level of consistency and persistence in hanging in there goes to show the dedication they have to their craft and converting it into art. In Titley’s history one reads with wry amusement, or perhaps a sad shake of the head, the repeated calls from the 1930s onwards for Galway to get a proper municipal gallery, a facility the city still lacks today. “The first reference to a municipal gallery for Galway was at a meeting held by the Galway Archaeological & Historical Society around 1912,” Titley points out, further underlining just how long the city has been waiting in vain for one. Tom offers some concluding remarks on the exhibition, a show which certainly makes a fitting tribute to the long history and many achievements of Galway Art Club and its membership: “As they are amateurs you would expect their exhibitions to be a bit uneven but I don’t have any problem with that because they are encouraging people to paint or to begin painting, to look at the world around them and recognise how good their own environment is.